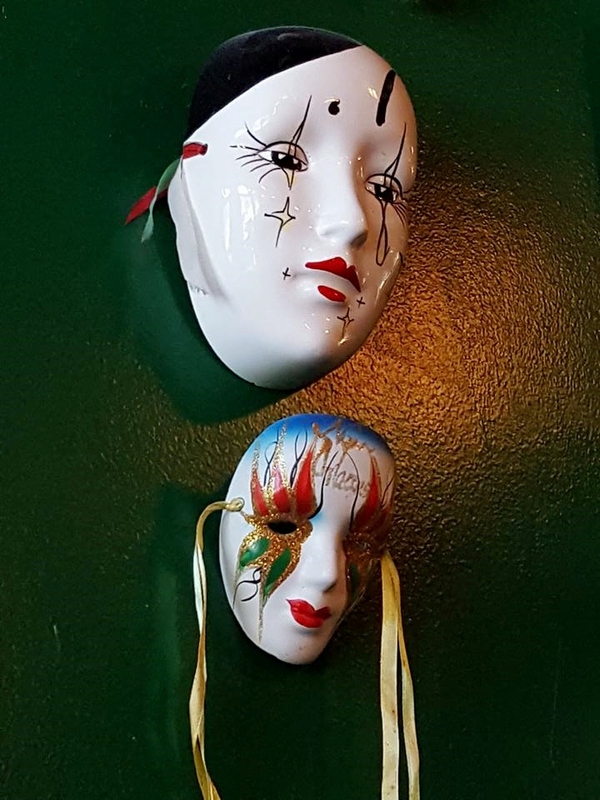 HIDDEN GEM RESTAURANT CHALLENGE #8: Geaux to Gumbeaux’s in Douglasville, Ga.
Next time you have a craving for spicy Cajun food, but can’t quite make it to New Orleans, head over to the 8th stop in the Hidden Gem Restaurant Challenge, Gumbeaux’s in Douglasville, Georgia. You’ll be transported to the Big Easy the moment you enter the front door. 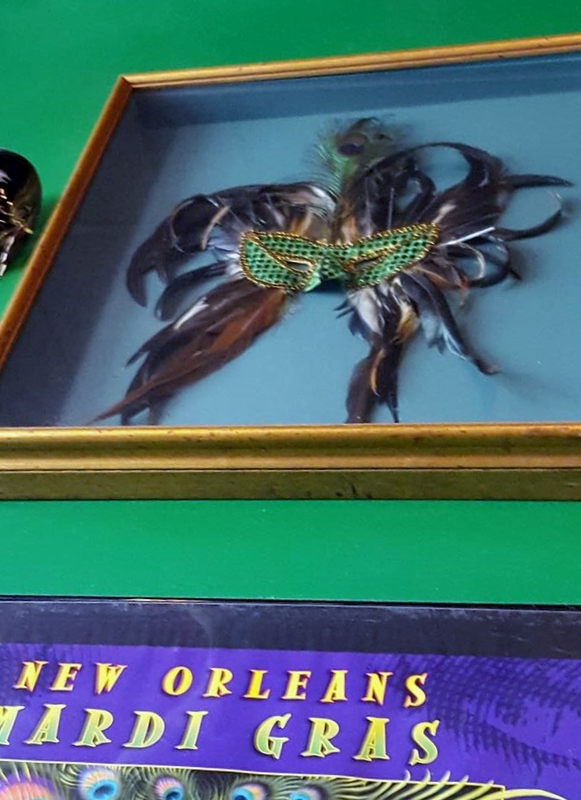 From the decor on the purple, green and gold walls, to the zydeco music softly playing in the background, to the authentic Cajun flavors, this is the closest you can get to New Orleans without the long drive. 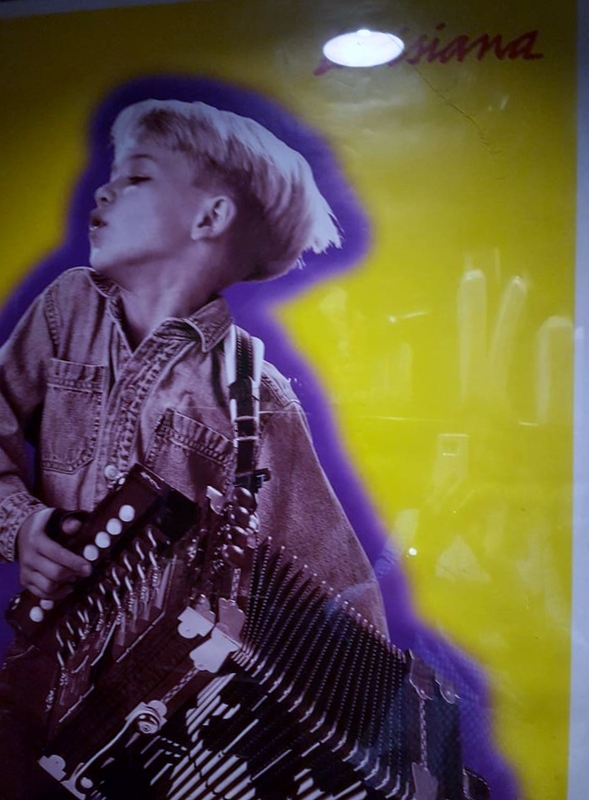 Established in 1994, by the Regan family, Gumbeaux’s is still family owned and operated. 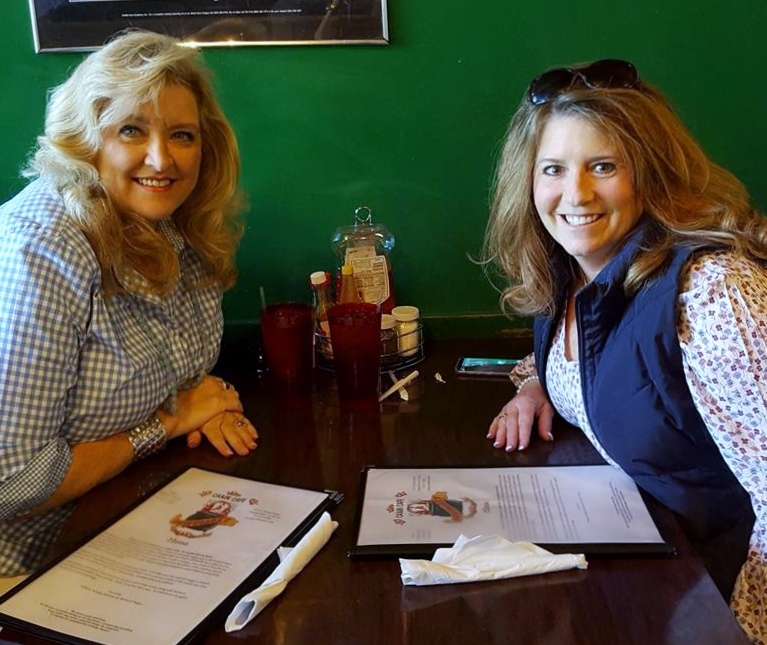 The extensive, reasonably-priced menu boasts a variety of dishes from south Louisiana, from creole to etouffee to jambalaya and boiled crawfish. Most of the seafood is fresh from the waters of the Louisiana bayous, the Gulf of Mexico and the Atlantic Ocean. Many of Gumbeaux’s dishes are made from scratch. In an effort to provide top quality food, most dishes aren’t pre-breaded or pre-cooked. Many of the menu items are spicy, as is to be expected of Cajun cuisine. 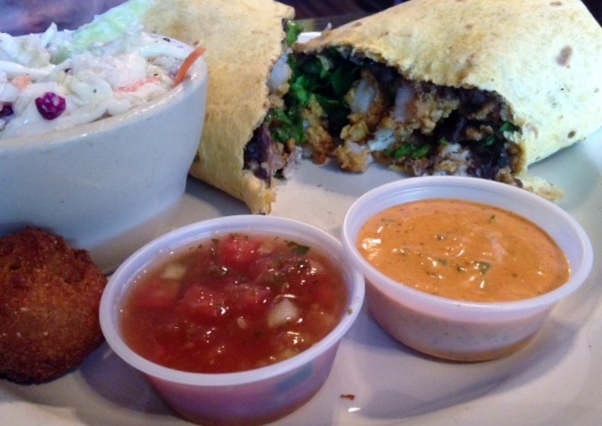 We realize that not everyone likes spicy food and the people at Gumbeaux’s know that too. 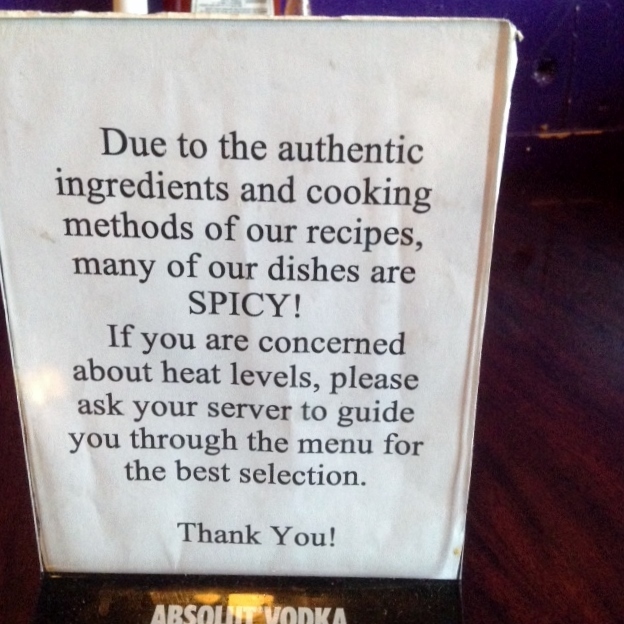 They even have signs on the tables to let you know that your server will be happy to guide you to some of the less spicy options. The day we were there, we overheard two different tables telling the server that they don’t like spicy food and they asked her what she recommends. She had the patience of Job both times. She was kind and helpful to both of them and provided prompt, courteous service. What more could you want? Linda is a gem. 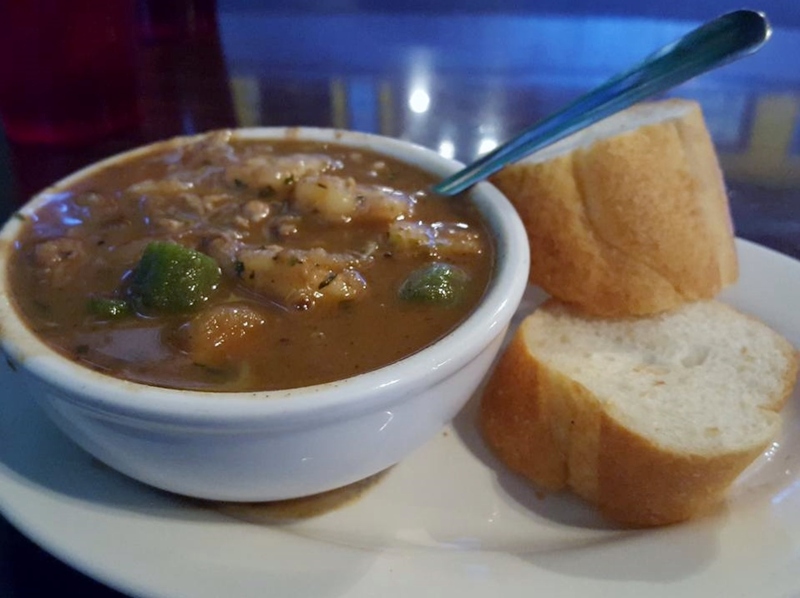 The Cajun Seafood Gumbo is very popular and it’s easy to see why. It’s a scrumptious combination of shrimp, oysters and crab, in a tasty dark roux, served over rice. The portions are so generous that a cup was more like a bowl! It comes with two slices of French baguette which is soft on the inside and the outside, making it easy to sop every last drop from the bowl. One of the things we’ve learned since starting pickypeaches.com, is that there are still foods that can surprise us. 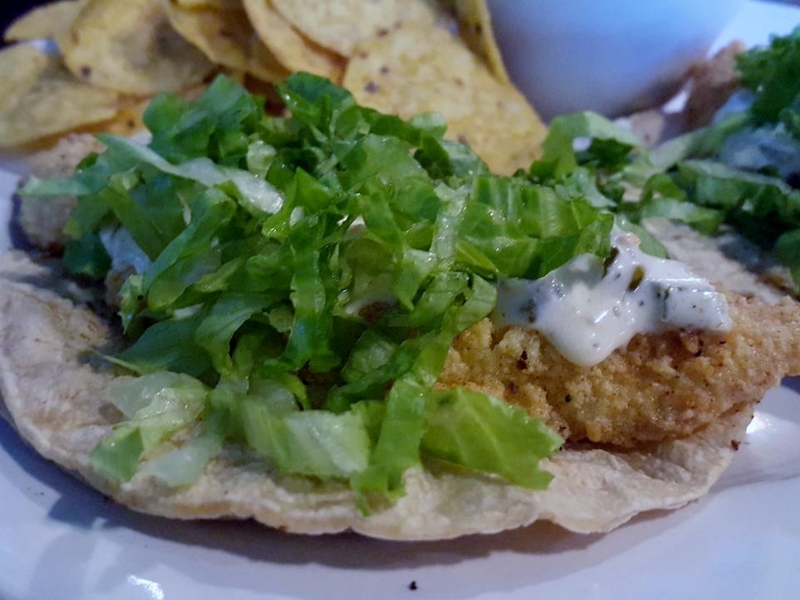 The Fish Taco at Gumbeaux’s is one of those foods! It’s so big that there’s only one in an order and it’s almost enough for two people to share. It looks more like a burrito than a taco because it’s a rolled soft jalapeño tortilla, filled with fried tilapia strips, fried shrimp, shredded lettuce, homemade black beans, cheese and homemade cucumber salsa. All that goodness is topped with a swirl of Tiger Bait Sauce. It comes with your choice of a side dish and we think the homemade coleslaw is the perfect mate. This version gets high marks because it is a crisp, refreshing blend of cabbage, vinegar and spices and not a mushy, mayonnaise mess. If a menu has a section on it called Fried Platters, you know it’s going to be good!Trouble deciding? On the Combination Platter, you get to choose two items: catfish, shrimp, gator, oyster, crawfish, tilapia strips or grouper strips. 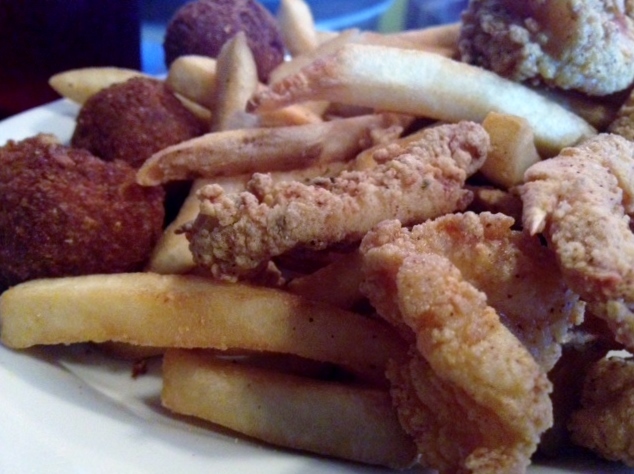 All Combination Platters are served on a bed of Cajun fries with hush puppies. All the fried food is lightly breaded, cooked to order and accompanied by homemade remoulade, cocktail and tartar sauces. 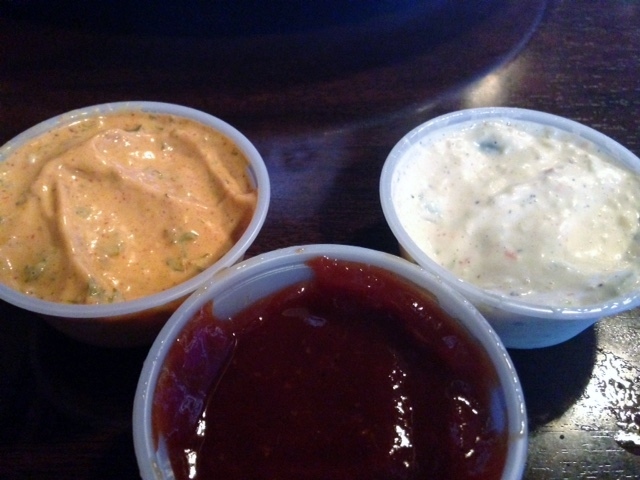 The sauces are so good! The remoulade is slightly spicy. The cocktail sauce has an unexpected smoky barbecue note and the tartar sauce contains crispy bits of cucumber. Try them all! Many of the entrées offer your choice of a side. Since no Cajun meal would be complete without red beans and rice, at least one person at your table should order them. They’re comfort food’s spicy cousin. The spicy turnip greens also get our vote. Check out the daily specials. 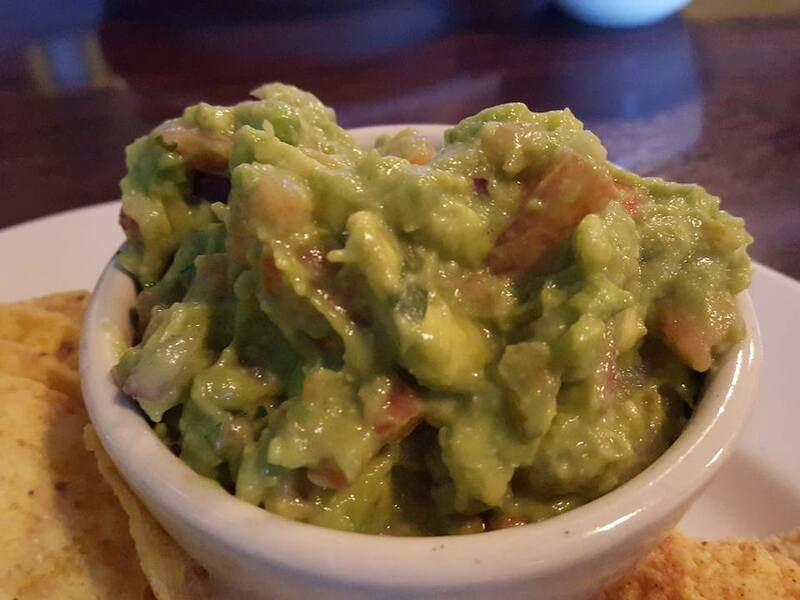 Some of them are unexpectedly original and delectable, like the shrimp guacamole, so be sure to ask your server. Got any room for dessert? 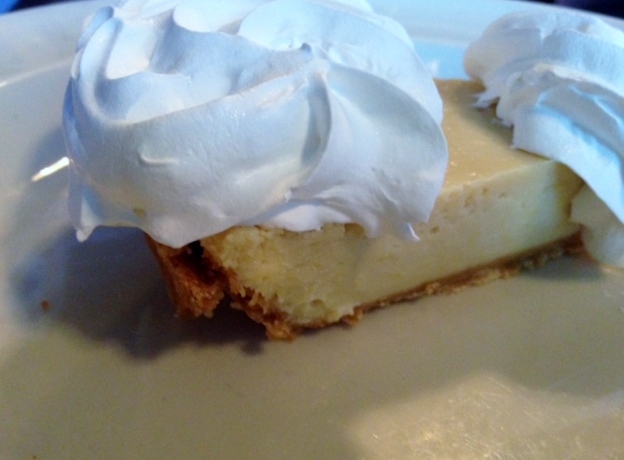 The creamy Key Lime Pie is a nice ending to an enjoyable meal. It’s the real deal and isn’t bright green. It’s yellow like it’s supposed to be. This perfect combination of sweet and tangy is large enough to share, so be sure to ask for two spoons. Psst! The restrooms are clean and some of the graffiti is entertaining. 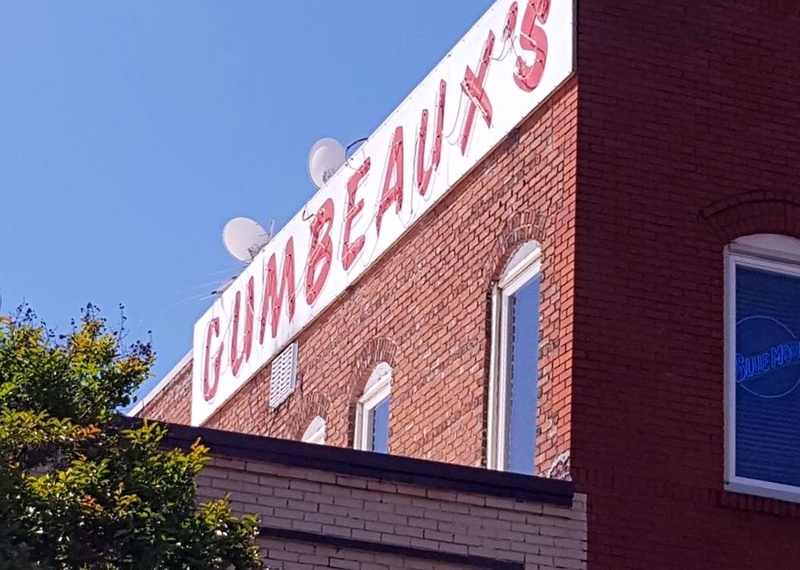 When we visited, a recent storm had blown down the sign over the front door, so look for the large Gumbeaux’s sign on the side of the building. If you have trouble finding a parking space on E. broad Street, go over one block for more spaces. Gumbeaux’s, 6712 E. Broad Street, Douglasville, GA 30134. Hours: Tuesday – Saturday Lunch 11 a.m. – 2 p.m. and Dinner 5 p.m. -10 p.m.
Join us, for a few minutes, next week to hear about the unique and fascinating Champ’s Clock Shop near Douglasville. It’s a great place to spend an hour or two. ← Step Away From the Salt Shaker!! !